raised to buy bibles for Malawian prisoners. First arriving in Malawi in 1965 Rev Howard G Taylor was ordained and inducted by Blantyre Synod in 1971. He requested a congregation where no one could speak English so as to force himself to learn Chichewa. This plan succeeded and Rev Howard Taylor is fondly remembered by Malawian ministers as someone who was a minister 'just like one of us'. During his time with Zomba and Blantyre presbyteries Rev Howard Taylor came into contact with Malawian prisoners and in the last two years has followed the news of the prisons ministry work in Malawi. During his final years and months Rev Taylor suffered from a debilitating and cruel illness, yet his mind remained clear to the end. While in palliative care in St Andrews, Scotland a Malawian lady working at the hospital would read the bible in Chichewa to Rev Howard G Taylor every day. He was clearly deeply moved by this final connection with Malawi, the bible and the Chichewa language. Unsurprisingly, the prisons that have not benefited from previous bible distributions are more outlying. Visitors to the prisons are usually deeply moved by what they experience. Visiting Malawian prisons is one of the outstanding encounters with the real Malawi, not to mention something Jesus mentions as separating the sheep from the goats (Matt 25). By paying a modest fee a group of people can contribute to the cost of transport as well as a few items that are of practical benefit (e.g. soap, clothing or particular food items otherwise unavailable). It should be noted that the Prison Chaplain, Rev Chimesya, does not currently have access to a vehicle for reaching remote prisons although this obstacle can be overcome during this project. It is hoped that the money raised for bibles and the activities associated with distribution will bring others into finding an interest in the prison ministry. By creating publicity, interest and momentum it is hoped that an ongoing legacy can be built which will continue to support the physical and spiritual needs of Malawian prisoners. Already committed to supporting this project and building upon it are the Prison Chaplain, the family of Rev Howard Taylor, The Bible Society of Malawi, The Scottish Bibles Society and the Friends of the Prison Ministry in Malawi. The Chairman of the Friends of the Prisons Ministry, Mr Zuwayo, is himself a retired Vice-Chairman of the Bible Society of Malawi. It is hoped that others can connect and provide practical support. 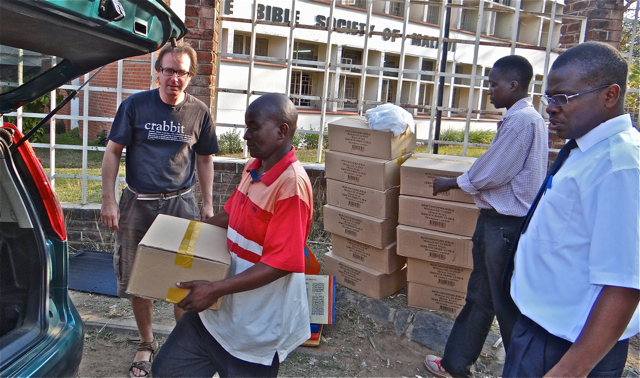 242 bibles purchased at the Bible Society of Malawi in Blantyre are loaded ready for distribution to prisons. Those receiving the bibles will not be restricted by denominational connections. The bible is for everyone. However, the existing structures that prisoners have, and the leaders of the Christian groups, will be given responsibility. The prison chaplain will advise and as has been mentioned elsewhere those prisons that do have bibles organise devotions on the basis of the prison cells with existing leadership teams. Furthermore, the prison groups are connected with local churches and Christians. These people will also help to advise on the distribution. In prisons where there is interaction between the lives of those inside and the Church outside there is great potential for enriching the lives of both. 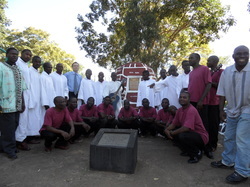 Recently the Chichiri Prison CCAP Choir recorded a CD at the Blantyre Synod recording studios. The quality of the recording and the music is very good. On an earlier occasion the choir performed on Malawi television. These are small examples of the what can be done as a result of interaction between those on the inside and out. In fact the rich Christian life of many inmates is a blessing for those who visit. Many are quite astonished at the range of activities and the organisation of the bible study and CCAP groups. Located in the middle of the city of Blantyre, Chichiri Prison is in a different position to many of the more outlying prisons where the logistics of a visit are a real challenge for the Prison Chaplain. Rev Chimesya and Douglas Taylor with some of the female inmates who attend the CCAP bible study and Sunday Services. Money raised at the funeral of Rev Howard Taylor has been used to purchase bibles for Malawian prisoners. 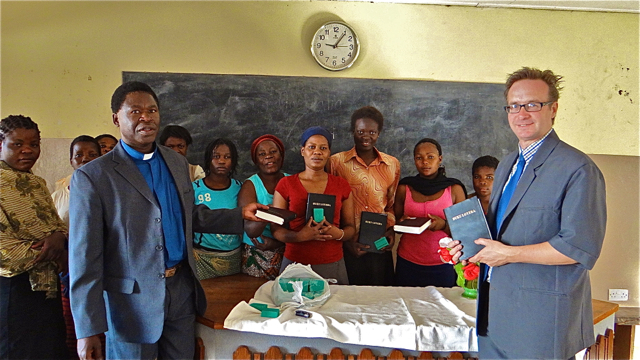 In total 242 Chichewa Bibles (new translation) were purchased from the Bible Society of Malawi in Blantyre. On Sunday 18th August 2013 the first 15 bibles were distributed at Chichiri Prison in Blantyre - five at the female section and ten in the male section. The presentations took place during the regular Sunday church services within the prison. Thanks are due to the prison authorities who gave special permission for photos to be taken during the bible distribution. The reason for allowing these photographs was to help promote further steps towards the distribution of bibles to more outlying prisons. In the lead photograph above some of the ladies who regularly attend the CCAP Thursday morning bible study are photographed with bibles and soap. A gift that addresses the physical needs of the prisoners (in this case soap) normally accompanies the gift of bibles although the source of funding is separate. Rev Chimesya, Synod Prison Chaplain, advised that the best version of the bible to purchase was the new translation in Chichewa. This version of the bible is much closer to the spoken Chichewa of today although the older version is read with affection by many. 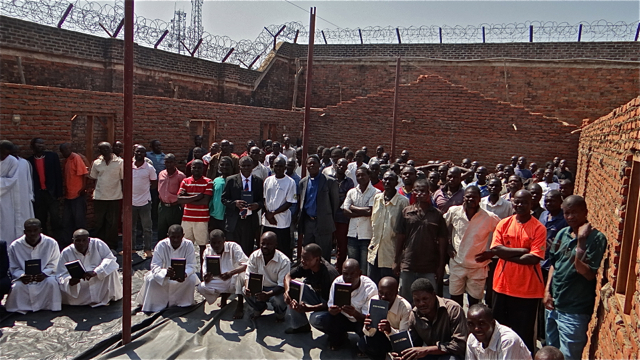 Male prisoners at Chichiri Prison with the new bibles. 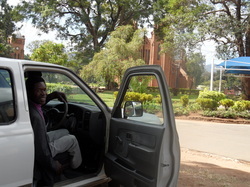 In addition to the bible distribution project, Rev Chimesya is involved building a new chapel within the prison. Here you can see it is part completed. The men dressed in white form part of the CCAP Prison Choir. The bible is one of the most highly valued possesions in Malawi. The last few years has seen a massive increase in the Christian life of many Malawian prisoners. Where in the past prison authorities exercised caution with regard to the gathering of large numbers of prisoners now huge numbers are seen attending Sunday Services within the prisons. Bible studies are similarly well attended. At the largest prison in Malawi the CCAP hold regular Tuesday (men) and Thursday (women) bible studies. At the men's bible studies anything from 50 to 200 are in attendance while in the female section between one third and a half of the inmates attend and take part. The bible knowledge held by prisoners varies from those with little knowledge to the encyclopedic. During bible studies questions posed by the prisoners tend to be dealt with in depth and until the questioners are fully satisfied by the investigation into the answer. A recent development within this prison are morning and evening devotions in the cells. These large cells contain many prisoners and each cell has bibles and study leaders. As a result of this ALL prisoners (in this prison) are exposed to the gospel and the bible every day. Sadly, not all prisons have enough bibles for this. There is a great shortage of bibles in most prisons but the hunger for the Word is as great. Join a group trip and come on an fascinating journey to a part of Malawi you might not otherwise see. Go with the prison chaplain delivering bibles to inmates. Contribute a modest sum to help cover transport costs. A friend of Rev Howard Taylor? Perhaps if abroad and you were not able to attend the funeral you can still contribute some funds for Bibles for Malawian Prisoners through a UK organisation that can link direct to the Malawi Bible Society who are supporting this project. Different organisations in different places can help in different ways. Those connected previously with Rev Howard Taylor can provide information and links on their websites to help with publicity. Also needed are the logistics for those seeking to securely send funds to the Malawi Bible Society for the direct purchase of Chichewa bibles. The Scottish Bible Society have kindly agreed to help with this. Malawian organisations that travel between Blantyre and areas where prisons are located may be able to help with transport and other friends connected with visiting prisons are also being approached for their practical help. 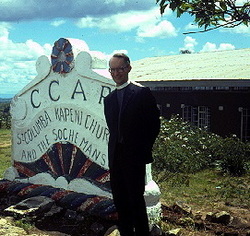 Rev Howard Taylor preaching in Chichewa in the 1970's. The Bible, the Chichewa language and Malawi were important parts of his life. The Scottish Bible Society in Edinburgh will be supporting the prisons ministry in Malawi by providing an online facility for supporters in the UK and around the world to donate money to support this project. Watch this space for news of the launch. Some of the very first translations of the bible into Malawian languages (handwritten) are held by the Scottish Bible Society.